This elegant armchair by Knoll Antimott was made circa 1928. It is in beech and has got typical Art Deco features. The chair got new upholstered with a beautiful flower fabric. A great eyecatcher for every home. Knoll Armchair by K. Antimott, Germany, circa 1950 Designed by Walter Knoll and newly reupholstered in Blush Cotton Fabric by Titley & Marr. Knoll Armchair by K. Antimott, Germany, circa 1950 Designed by Walter Knoll and newly reupholstered in Blue Cotton Fabric by Titley & Marr. 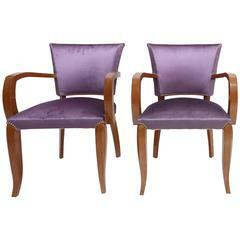 These elegant 1930s cane and solid cherry armchairs are designed by Walter and Wilhelm Knoll for Knoll Antimott. The cushions have new upholstery and the cane has no damage. 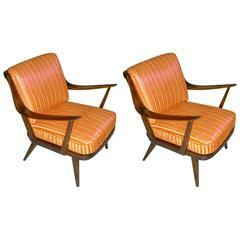 This pair of relax armchairs can be changed into lounge chairs. They are signed Knoll Antimott. The velvet is original. America, circa 1960.